Crowded service stations, no breaks, overtired and in the end too late at the customer’s. Highways are the new logistics warehouses. Just-in-time production is one of many reasons why the demand for means of transport is intensifying motorway traffic. Many companies deliver their products “just in time” before further processing in production to reduce storage costs. The Federal Ministry of Transport and Digital Infrastructure of Germany expects that the demand for means of transport will rise up to almost 40% by 2030. 45,000 jobs in the driver market are not filled. According to data from the Dekra Labour Market Report, almost 50,000 professional drivers are currently retiring. At the same time, freight forwarders train 10,000 beginners every year. This imbalance has both an impact on transport and considerable side effects on logistics and the economy. Wage dumping and poor working conditions are causing more and more young people to reject the profession. Unfair competitive conditions increase competition on the logistics labor market. Every third truck driver comes from Eastern Europe. Their wages are far below the German minimum wage. The Romanian minimum wage, for example, is €422 per month. Accordingly, the competitor from Eastern Europe is much cheaper for freight forwarders than the German trucker. The German truck driver, on the other hand, earns an average of €2,000 gross. What seems a lot in a direct comparison, however, is discussable in view of exploding rents in many regions, the financial support of one’s own family and in terms of stress. The profession remains uninteresting for newcomers. Some freight forwarders therefore offer entry fees of more than €2,000 when entering the profession. In order to remain competitive themselves, many truck drivers ignore their break. Tightly calculated delivery times for long routes exert time pressure and stress on the trucker, which leads to truckers not noticing rest periods and becoming overtired. Time pressure can cause truckers to become careless and fail to observe safety distances. The pressure often results in not having enough time to load the goods, which is why safe securement of the cargo is not guaranteed. Drivers not only put themselves in danger but also increase the risk of other road users being involved in accidents. For example, on 13.06.2018, around 600 beer crates slipped from the loading area of a semi-trailer truck on the A70 while he wanted to drive onto the motorway. Nobody was injured in this accident. Crowded rest stops are keeping truck drivers awake. All truck drivers are suffering from the lack of infrastructure expansion. When a driver finally arrives at the next service area after a long shift, it is completely parked. The professional driver has no choice but to drive to the next service area in the hope that the police will not stop him. Otherwise, he would have to reckon with a fine of €30 per hour, which he continues to drive. Truck drivers have to take legally prescribed breaks to protect their health and other road users. Forwarding companies must make the job attractive again for potential professional drivers. Logistics suffers from the lack of available employees. The shortage affects everybody – from the dispatcher to the end customer, who waits for his goods with a delay. The scheduled sequence shifts within the supply chain. This leads to communication and relationship problems between the forwarding company and the customer. Logistics has to improve working conditions for professional drivers in the future. 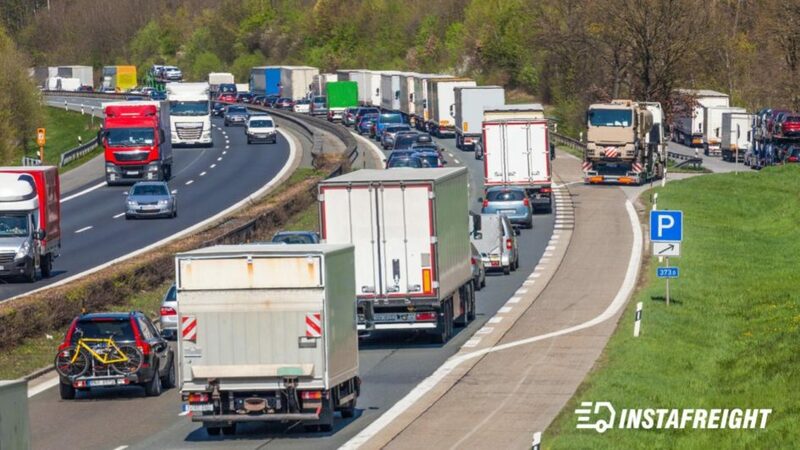 The EU Ministry of Transport agrees that in future truck drivers will no longer be allowed to sleep in the driver’s cabin during their 45 hour weekly break. Forwarders will be obliged to pay accommodation for their drivers. According to Transport Minister Norbert Hoefer, overcrowded service areas could thus be avoided. But in most cases there are no better or even no alternatives other than the trucker’s own driver’s cab. For this reason, an expansion of the infrastructure and the construction of more parking spaces are urgently needed to enable short rest periods at rest areas. A higher frequency of controls on taking breaks and higher penalties for freight forwarders need to be imposed. Short breaks already improve concentration and reduce the risk of accidents. A functioning regional collective agreement within the EU would enable logistics to compete fairly and avoid social dumping and undeclared work in the future. A legislative package is currently being negotiated in the European Parliament, which speaks against social as well as wage dumping in the future. Consequently, the occupation could become attractive for potential young trainees in order to overcome the lack of 45,000 professional drivers. The deficit of drivers is not only a threat to logistics, but to the economy as a whole. Visit our website and register for our newsletter! InstaFreight is a online B2B forwarding company, which enables customers to book transports online within a few seconds. In this blog we want to take a closer look at current logistics topics and share our point of view with you. Post-Brexit – How does the withdrawal affect the logistics market? Autonomous driving – Do we hand over our control?